When Amanda and Nick Cannizzaro of Montclair booked a honeymoon trip to Riviera Maya, Mexico, they decided to fly out of John F. Kennedy International Airport instead of Newark Liberty because the flights were $500 cheaper. The return flight went back to JFK, too. The couple was supposed to be picked up by their parents, but then there was unexpected car trouble. “We were standing outside the terminal with all of our bags deciding what to do,” Amanda Cannizzaro said. They would have to find another way to his parents’ house in Cedar Grove. In the interest of full disclosure, Nick Cannizzaro is an employee of NJ Advance Media. Bamboozled decided to review this case because what happened to the couple is happening elsewhere — something later confirmed by Uber — and consumers need to be warned. Amanda Cannizzaro said they saw a line of cabs, which included some cars with Uber signs in their windows. They decided to use the Uber app to request a car. They’d taken Ubers many times before, they said, and the experiences were all good. 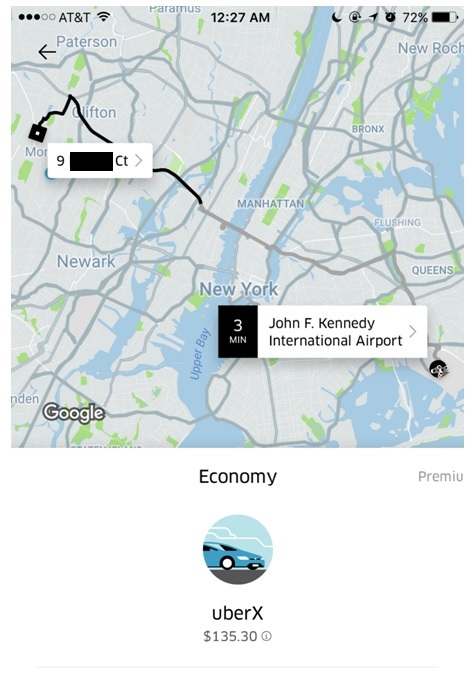 A screen shot of the real Uber price for a ride from JFK Airport to the Cannizzaro’s New Jersey location. Before the couple requested the car, several drivers approached them to ask if they needed a ride, they said. Some even said they were from Uber. The couple ignored them and made the official request through Uber the app, which quoted a price of about $135. That’s when a 2017 black Chevrolet Suburban sporting an Uber sign in the window pulled up. They hadn’t requested such a large car, and they hesitated. The driver worked quickly, telling them he was an Uber. He took their bags and loaded them into the trunk. Not knowing the backend capabilities of the Uber app or how charges are issued on the driver’s side, the couple believed him. They said the driver confirmed the same price, and they had a good ride. They didn’t know it, but the driver was an Uber imposter, one of many who hang out at area airports. The couple called the driver personable, and they said they were comfortable — until the ride was over. The couple reminded the driver they were quoted $135. The driver said the higher price was because he was an “Uber Black,” which is the luxury version of Uber. After the fact, the couple looked up the cost of an Uber Black for the same ride, and the app quotes $228. The couple said they weren’t sure what to do. They said they felt uncomfortable, in a stranger’s car with the doors locked and their luggage in his trunk, and the driver was demanding money. They couple thought they were being swindled, but Nick Cannizzaro is an American Express customer. The couple had positive experiences with the company solving bogus or fraudulent charges, so they figured they’d be safe. In hindsight, the couple said, they should have gotten the driver’s license plate number and called the police immediately. Instead, they went inside and called American Express. A screen shot of the $524.11 charge on the couple’s American Express card. The couple disputed the charge, which showed on the credit card statement as a direct charge to Saifuddin Mahmud — the driver — for $524.11. The statement also showed a charge $140.50 charge from Uber. Next, the couple said, they contacted Uber. “They couldn’t really tell us anything about individual drivers and whether they are legitimate or not because they are actually contract workers and technically work for themselves,” Amanda Cannizzaro said. The lower charge from Uber stayed as “pending” and eventually disappeared, but the $524.11 charge never did. The couple’s dispute with Amex was denied. They disputed again, and it was denied again. “The last we heard from American Express is that we are responsible for the charge because the driver provided them a written statement of what happened — which is handwritten in broken English on looseleaf paper — saying he told us the price upon us getting in the car. Not true,” Cannizzaro said. 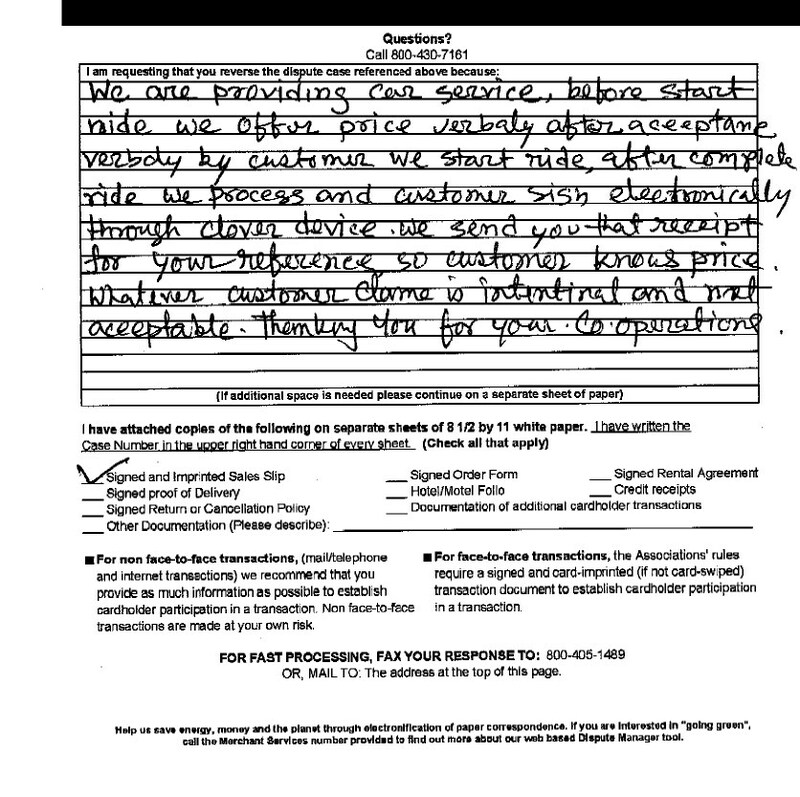 An image of the handwritten note written by the driver to American Express. The couple did some research on their own, finding lots of stories about fake Uber drivers scamming people New York City airports. “Coincidence? We think not,” she said. The couple, furious that American Express sided with the driver, filed a police report. Cedar Grove police said if they wanted to file charges, they’d have to do so in New York. After using the police report to file their third dispute with American Express, the couple contacted Bamboozled. They said they didn’t expect to get any money back, but they wanted to warn other drivers not to fall for this scam. We asked American Express to review the case, and then we reached out to Uber. Spokeswoman Susan Hendrick said Uber has heard similar complaints, so just last week, it launched a public awareness campaign. She said riders always need to request trips through the Uber app, and they should never be asked to pay with a credit card. All payments should go through the app, every time. When a rider requests a trip through the app, the app will show the driver’s photo, name, the car make/model and its license plate number, Hendrick said. As part of the awareness campaign, she said, Uber is asking riders to double-check two important details provided by the app — the driver and the vehicle — to make sure the information matches before starting a trip. Here’s a look at Uber’s blog post with additional information. 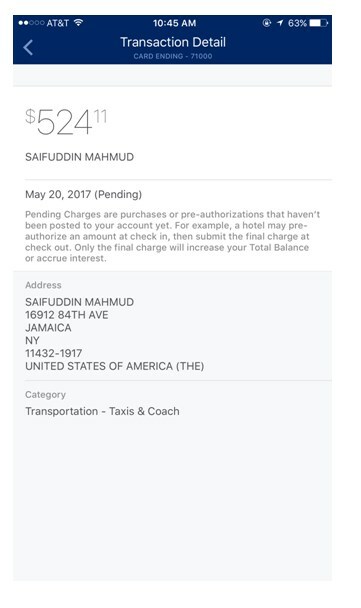 We next called the driver, Saifuddin Mahmud, at the telephone number provided on his American Express dispute response. After Mahmud answered the phone and confirmed his name, we explained why we were calling. Before we finished, he hung up the phone. Then we waited for American Express. The Cannizzaros’ online account says the dispute will be resolved by Sept. 28. Let’s hope it’s a lot sooner. “Funny how in the end we were scammed out of the same $500 we thought we were saving [by flying out of JFK],” Cannizzaro said.